Hard to Handle- I needed help with my son, not separation. I was only 17 when I became pregnant. It was not the happiest moment in my house when I announced my pregnancy. Everyone wished for abortion. After Remi was born, I soon found out that raising a baby is hard, dedicated work. At times, it seemed as if everyone was right—too early, too fast, what kind of future would I give my baby? But the beginning of my life as a mom was also great. I had easy babysitting. Remi was so cute, so cuddly, that no one could stay away. But motherhood got harder when Remi was about 1 year old. He was more energetic and excited than I expected. I thought we’d go out every weekend to playgrounds, beaches and museums, and that on the weekdays we would be in bed early. I thought Remi would be softer, calmer. I wondered if something was truly wrong with my son. I was overwhelmed and would cry, not knowing what to do. I needed help. But all those who were so eager to help when Remi was a newborn suddenly had an attitude: “No one told you to have a baby. You wanted him, you raise him.” I felt so alone. That year, Remi and I really didn’t associate too much with people because Remi was always into something. I would go to my mother’s house and Remi would break her figurines. I could only apologize and leave. 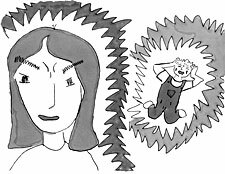 Looking back now, I see that she was right—Remi usually got his way because he would throw tantrums when he didn’t, and I didn’t know how to handle him. I believe that if I had set more limits with Remi when he was young, he could have learned that bad behavior wouldn’t get him anything. With my second baby, who came along years later, I knew better than to let him sleep with me in the bed instead of putting him in the crib, or to hold him for hours after he was sleep just because he was so cute. I learned to set limits with my younger children before their behavior became a serious issue. But I didn’t realize how I was influencing Remi. I rewarded bad behavior, laughing at the silly things he did. I loved him and wanted him happy, and I thought that meant giving him everything he wanted. I also know now about services that could’ve helped Remi and me. The Nurse-Family Partnership would have been good for me—you sign up when you’re pregnant, and a nurse visits you and helps you out for the first two years of the baby’s life. A nurse’s guidance could have helped me. But I didn’t know about that service back then. I did call Early Intervention, a program that evaluates your child (up to 3 years old) and provides you and your baby with free services if the baby’s development is delayed in any way. But all they gave Remi was speech therapy twice a week, which helped him talk better. The idea was that if he could express his needs better, he would be less frustrated and would behave better. But his behavior did not improve. The night before Remi’s second birthday changed our lives. Remi and I were alone in our apartment. I was taking a shower and Remi was in his crib. When I got out of the shower, I saw that the front door was open. Remi was gone from his crib. I freaked out, ran to the door and there he was, playing outside all alone. God forgive me but I just flipped out. I was scared for me and for him. Someone could have taken him, or hurt him. So I panicked and made the biggest mistake of my life: I hit my son. I hit Remi two times and then brought him in the house and put him in his crib. I walked around the house to calm myself but he kept on crying so I took him out and cried with him, apologizing over and over again, rubbing him until he fell asleep with me. He had a bruise on his arm and on his face, and a small red mark on his back. I felt terrible. I never meant to hurt my little man. The following day, my mother and aunt were coming to take Remi for the weekend, a birthday treat. They saw the bruises. What could I say? I told them what Remi had done and what I had done, and said that I was sorry for my actions. I thought they would say, “Call me when you need help,” but all I got was a mouthful. Then they left. I called everyone I knew, freaking out, hysterical. My mom and aunt would not call me back. Monday morning I got a phone call from a worker who said, “Your son is in the custody of the child welfare system and you must appear in court today.” I rushed over to family court and was arrested on the spot. “What are the charges?” I asked. After hours of being at the precinct, I wrote out a statement describing exactly what happened. I thought the system would help me. I was doing my best as a mother, holding down a job and going to school. I’d never been in trouble in my life. Now I see that my statement just helped bury me alive. I was incarcerated for three days. When I got out, I found out that Remi was placed with my aunt. I was furious! That witch! That day I saw Remi at her house. I felt like I hadn’t seen him in years. I grabbed him and hugged him and told my aunt I was taking him home with me. “No, an ACS worker is coming over now to take him to foster care,” she told me. It turned out that my dear aunty couldn’t control Remi, either. “Hell, no,” I said. I got aggressive. Soon my aunt and I were in the street, and the worker and some other lady were there telling me that my son was going with them. “Relax and wait for your court date,” they told me. I was lost, crushed. Remi was my life, my all. I blamed my family for this mess; the fury I held was deep. I was also furious with myself for hurting my son. The only bright moments were my visits with Remi. Most of our visits were hugs and kisses. The time just flew by. Finally, within a year, I finished all the services requested of me and was getting ready to get my man back. I had an apartment, I was working, I had unsupervised visits, and things were looking brighter. Then we found out that, since my fiancé lived with me, he had to do all the classes too. My only other option was to kick him out of the house. I crumbled. I couldn’t believe my ears. Why wasn’t I told this at the beginning? For two more years, Remi and I were apart. Time passed us by for no reason. My fiancé completed parenting and counseling and anger management, but still, no Remi came home. During that time, the caseworkers were coming and going like flies. I had to wait until each one got acquainted with my case, then I would get called in to talk. That was never pleasant. Funny, workers seemed to think they had the right to judge me as if they knew me from reading a file. Some didn’t even have kids and wanted to tell me what to do with my son. I got nothing but the runaround: “Yes, Ms. Vega, your son will return home soon.” “Be patient and give me time to catch up to your case.” “Papers will be in order for discharge next month, we’re almost there.” All lies. I began to feel hate toward ACS, and that’s a word I barely use. It is a strong word, but I hated them. They were dragging our case along as if it my son’s life could be put on hold. Finally we got weekend visits. Man, was I excited to see my little man sleeping in his bed in his house. Nothing could be better. But those visits lasted five months with no word of when we’d reunify for good. “You can’t do that,” she said. But the foster mom backed me up, and after some fussing and fighting, the worker agreed. She brought the discharge papers to my door the next day. It felt so good to have my baby back home. No one could tell us the visit was over. There was no limit to our walks and talks. We went out to the movies and played board games, especially Monopoly, our favorite. We still had a bond despite the years of nurture, love and fun that we had missed. As the days went by, our laughs became stronger and our hearts became fuller. In some ways, Remi was no different at 5 than he had been as a baby. He was hyper, with strong emotions. He also seemed angry inside, and more cautious. Maybe it was just in my head but Remi felt too empty to me. He would put on sad faces for no reason, or cry at night while he was sleep. Sometimes Remi acted resentful. He didn’t want to eat what I cooked and would throw all his clothes on the floor from his drawers. He claimed that his foster mother let him do whatever he wanted. Sometimes I feared that my boy didn’t want to be home. I caught myself falling to sleep near his bed on the floor, as if I never wanted him to leave my sight. I felt attached to him yet cautious of how I acted around him. I wanted nothing more than fir Remi to feel at home and safe. Finally, after a few months, it felt like Remi had adjusted. But I still think Remi’s three years in foster care had a traumatic effect on him and on me. We both have bad, bad memories of what never should have been. Many times I still feel angry. The child welfare system did nothing but take my baby and give him back to me three years later, scarred, sadder, angrier, more confused and just as wild as he was before. Why didn’t the system send us to a mother-and-child residence where I could have learned how to handle him? Or check up on me while I got services and Remi stayed at home? Why didn’t I have a parent advocate who might have been able to help me get my son home sooner? Most of all, why didn’t anyone sit down with my family and me and help us talk about how I could get the support I needed without Remi being harmed by years in care? When my mother and aunt called ACS on me, I don’t think they realized that the child welfare system was so messed up that it would take three years for Remi to come home. As angry as we were at each other, I know my aunt and mother cared about Remi and me. If we’d been supported in working together to find a solution, they could’ve helped out while I found services to learn how to care for Remi. I also don’t think that my mom and aunt realized how their phone call would change our relationship forever. Four years after Remi came home, we began to talk again, but I feel that I will resent them forever for the tragedy they started. When I sit and think of the day I hit Remi, I feel overwhelmed. Those two seconds of our lives ruined us. I believe that God has forgiven me for hitting Remi and that Remi has forgiven me, too. I also believe our love for each other was never broken despite our years apart. But I am angry that we suffered. Remi and I needed support, not separation.